Adopt Your Rubber Ducks Today! 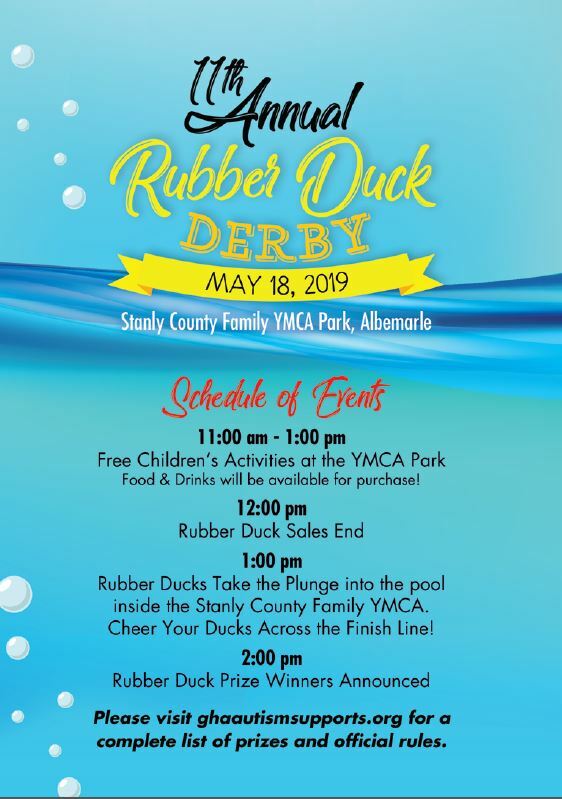 The GHA Rubber Duck Derby will take place on Saturday, May 18th at the Stanly County Family YMCA Park in Albemarle, North Carolina. All rubber ducks will be provided by GHA Autism Supports (the event organizer) and will remain the property of GHA Autism Supports. 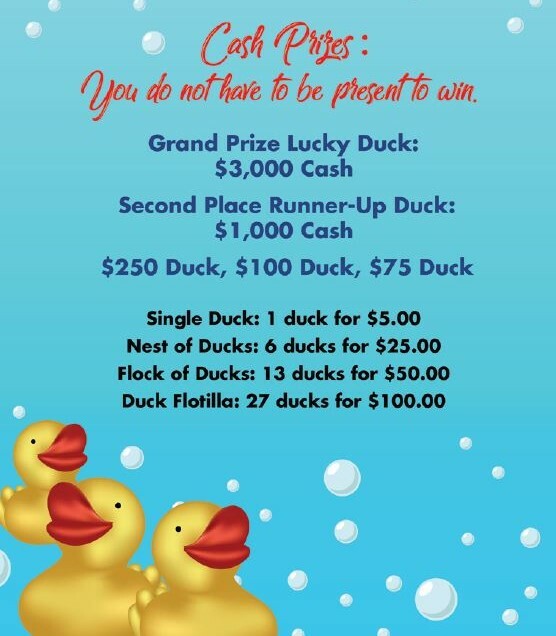 *Chances of winning will be determined by the number of rubber ducks entered into the race and the number of available prizes. Approximately 6,800 rubber ducks will be entered into the race. Rubber ducks will be available for purchase until Noon on Saturday, May 18, 2019. *In the event of inclement weather, acts of God or other circumstances, the event organizer reserves the right to cancel the race. Winners will be determined by a random drawing, in its sole discretion. Weather information will be posted at www.ghaautismsupports.org . *Once the rubber ducks are launched, participants may not interfere with any rubber duck. The race course will be determined by the event organizer. Attempt may be made by the event organizer or specified designee to keep the rubber ducks moving. Some rubber ducks may not complete the race course due to natural impediments, hazards, and weather. Such circumstances are random. *A number will be on the bottom of each duck and will correspond to an adoption certificate and/or listing of names and numbers by the event organizer. The person’s name that appears on the adoption certificate and/or list corresponding to the first ducks in the order of retrieval will be awarded prizes. *Entrants assume all risk of non-delivery of any entry submitted by mail. *Any and all taxes, titles, and similar fees are the sole responsibility of the winner. Winners should consult their tax professional for information related to taxes on prizes. All entrants should consult their tax professional regarding any tax deductions related to the GHA Rubber Duck Derby. *By entering, participants release GHA Autism Supports and its offices, staff, directors and any other related entities from any and all liability with respect to prizes, and consents to the use of their names and likenesses without additional compensation. *All proceeds will benefit GHA Autism Supports. *The event is subject to all federal, state and local laws and regulation and void where prohibited by law. * All decisions and interpretation of rules and regulation will be made by GHA Autism Supports. Decisions are final. *Prizes will be announced immediately following the completion of the race. Winners, if not present, will be notified by phone or mail. If the prize is unclaimed after 30 days, GHA Autism Supports will select a winner through a random drawing of all entry tickets. All prizes will be awarded. Complete list of winners at www.ghaautismsupports.org . *You may request a list of all winners by writing to Beth Olivieri, GHA Autism Supports, PO Box 2487, Albemarle, North Carolina 28002. * For more information, please call Beth Olivieri at GHA Autism Supports at 1-704-982-9600, ext. 125.